[AUTO](VC/RC):[Soul Blast (2)] When this unit’s attack hits, you may pay the cost. If you do, choose one of your «Bermuda Triangle» rear-guards, and return it to your hand. Well, okay. I didn’t want to choose anything from Pacifica and I couldn’t name any other boss card worth mentioning…so I blew it on this. Remember when this was good? Oh wait, that was never. My bad. Once mono-BT became a legal deck, Pacifica with Carine or Riviere was the norm. What’s up, Rogue Squad?! 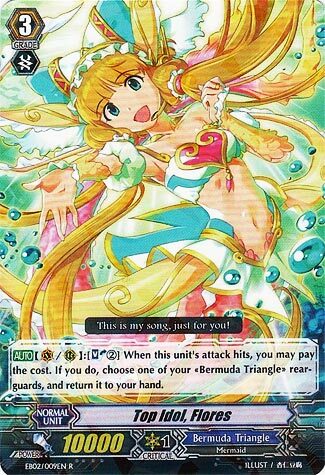 For today’s Throwback, ohhhh boy, have the years not been nice to you…the first idol of Bermuda Triangle unfortunately was easily overshadowed by every other boss idol that came after her, and nowadays, unfortunately, there’s no space for any mermaid build. Next Time: Only Heal Triggers can call out G Guardians, right…right…?